Trying to make a start in basic kite making? Without actually providing step-by-step instructions, this page will get you off to a good start. I will show you how to build possibly the quickest, simplest and most fool-proof type of kite that results in reasonable flying performance. It will also prove very cheap to put together. Sure, you can spend more time and make rather more interesting and higher-performing kites than these. The books over there on the right can teach you all about that. But the ultra-simple Diamond described below will provide the all-important early success that you need. Then, you might end up really motivated to progress further in the hobby. Great durability or crash-resistance, is not a priority here, since you just want to see your creation fly, right? ASAP! After a bit of the inevitable wear-and-tear, you can just patch things up with a bit of tape. Or even quickly whip up another kite. In time, you might move on to less basic kite making techniques which result in hardier kites. Besides, you'll be less prone to mis-treat them then! Try this Stake Line Winder from Amazon if you need some flying line. The 30 pound rated Dacron is good for a wide variety of small to medium sized kites. Anything with a span of 2 meters (7 feet) or more would be safer on heavier line. Finding spar material, that is, the sticks that the sail is attached to, is a little harder. But still fairly straight-forward. For rather small kites, you can experiment with bamboo skewers. Find them in any supermarket. Kites around 1 meter (3 feet) in height can employ 5mm (3/16") hard wooden dowel. Hardware stores sell wooden dowel. 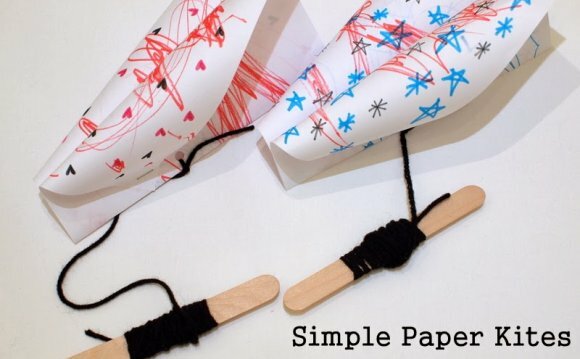 Here's the trick with basic kite making using wooden dowel... If your finished kite bends like crazy and flops about on the end of the line without flying well, the dowel is too narrow. Go up a size or 2 and try again! At the other extreme, if your kite needs a fresh breeze to even look like flying, your dowel is far too thick and heavy. Go down a size or 2 and try again! A light wind is all the kite should need. Armed with the diagram down there, and the general guidelines already given, you have a great chance of seeing your very own Diamond kite soar up high into the blue. Or gray or white or whatever. Soon. Quickie - no sail edging required! See how the flying line attaches to where the spars cross. The location of that crossing-point is important. Stick to it exactly, and you should not be disappointed when the kite is ready for a test fly.